The Jessie Richardson Theatre Awards are held each year to recognize and honour outstanding contributions to theatre in Vancouver. This year, I was there, attending as media and covering the event for my friend Raul Pacheco-Vega and his blog, Hummingbird604.com. For my coverage of the 2011 Jessies, please visit Hummingbird604. I bought this dress for $5 from a naked hippie on Wreck Beach! Because I tried to keep my post a little more professional (keeping in mind that I am a guest on Raul’s site), I’ll use my space on NiftyNotCool to express just how totally jazzed I was. I was totally jazzed. I did my hair. I put on dangle-y earrings. And heels. 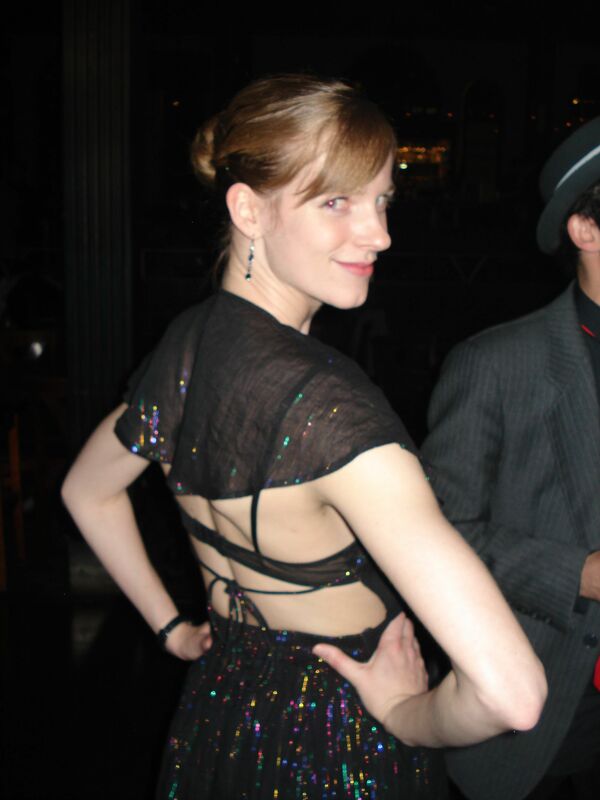 And a sparkly dress that I think is just a bit cheeky. Red lipstick. Hooray. I had a great night. I was inspired and educated (there is still so much theatre I need to see, and so many companies whose work I want to be more familiar with) and just plain ol’ JAZZED to be there. The lovely Lois Dawson and me. LOVE that blue! I also got to boogie down with Lois Dawson and the Pacific Theatre crew, whose season I was able to enjoy mostly through Lois’ generosity. Everyone was fabulous. Theatre people are the best dancers. 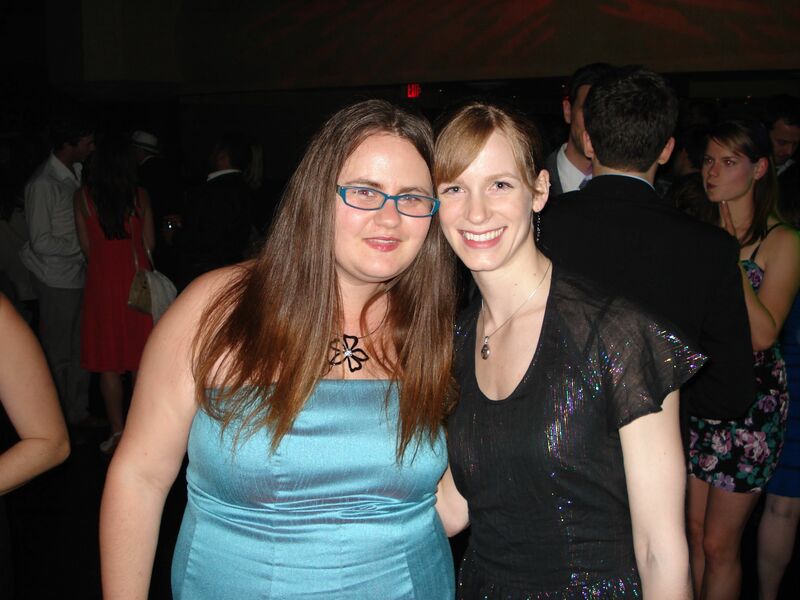 Furthermore, theatre people clean up well. Since I spend most of my theatrical time in rehearsals in sweat pants, or onstage in some crazy get-up, I sometimes forget what a fine-looking bunch theatre people really are. Damn. We are a fine-looking bunch. Don’t believe me? Come to the Jessies next year and cut a rug with us. Want more information about what happened at the 29th Annual Jessie Awards? Read all about it at Hummingbird604.com. Of course I must give a huge THANK YOU to Raul at Hummingbird604 for sending me to the ceremony on his behalf. Being able to cover the 2011 Jessies was a lovely end to a great season of Vancouver theatre. That is the nicest dress ever sold by a naked hippy. They actually set up huge clothes lines on Wreck Beach where they sell dresses and hippie pants and beach blankets. Though my dress really is pretty rockin’ for $5. That is by far the best $5 dress I’ve ever seen. I wish someone would do that at Brightsand Lake!